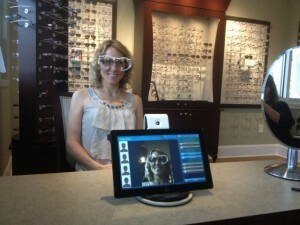 Hazel Family Eyecare is proud to be using the latest in eyeglass fitting technology. The M'eye fit digital measuring system allows us to precisely measure the optical center of the lens and ensure it is aligned with your pupil and unique visual lines of site. This technology has been amazing and has essentially eliminated measuring and fitting errors. The latest in progressive lens technology integrates personal factors such as hand and eye dominance and how an individual might tilt their head when reading. " The M'eye fit helps us fit the eyeglasses uniquely for each patient. It's pretty incredible and patients have appreciated the difference" states Liz, optician at Hazel Family Eyecare. Do you have trouble making a decision on your frame? One can also compare their favorite selections in a multiple image screen shot. The m'eye fit also does a wonderful job educating patients on their lens options. Anti-reflective coatings, high index lenses, transitions.. it's a lot to sort through. The little tutorials have been beneficial in answering any questions on these options. We hope that you will stop in and check out our frame selection and utilize the M'eye fit yourself!